Manny Ramirez, who has some of his father’s famous fun side, is expected to be chosen in this week’s MLB draft. BRADENTON, Fla. — It’s 2004, and 9-year-old Manny Ramirez Jr. has just left Fenway Park with his famous father after a ballgame. Young fans chase their car out of the players’ parking lot. An ancient “curse” is about to be broken, and Manny Mania rules Beantown. Some would dismiss that as “Manny being Manny,” an act that may have been funny for nearly two decades until two violations of Major League Baseball’s banned-substance policy resulted in suspensions that torpedoed a certain Hall of Fame career. Today, Manny Ramirez is a graying Rhino playing in Taiwan, still hitting at the age of 41. But Manny Jr. is a graduating high school baseball star who is expected to get taken in the middle rounds of the amateur draft this week. Scouts say that Ramirez Jr. is calm, mature, hard-working, and humble. Photos: Meet Manny Ramirez Jr.
Manny Jr. looks eerily like his father as a Cleveland Indians rookie in 1993. But at 6 feet 4 inches and 205 pounds, he is taller, has a more open stance, and prefers playing first base to the outfield. 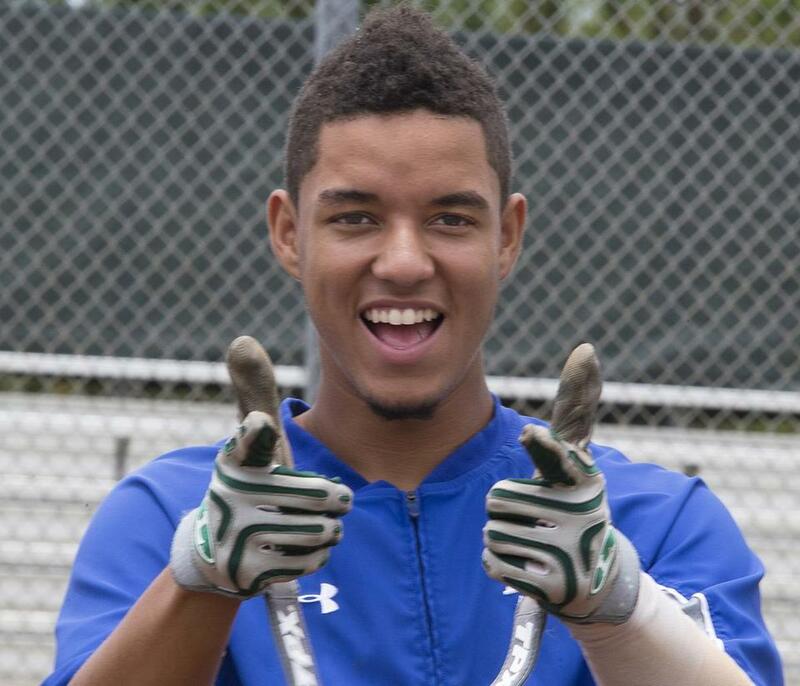 Manny Jr. is supposed to be busy taking a final this morning at IMG Academy, which provides academic as well as athletic training to students, but instead he is finished early and heads for the batting cage. That’s just Junior being Junior. “I just eat, sleep, and dream baseball,” he says. He is a cage rat, coaches say. Bolek has a unique perspective on all things Ramirez. He was an outfield coach for the Indians when Manny Ramirez was a September callup in 1993. He sees the same picture-perfect swing and hard-core work ethic that he saw in his father some 555 home runs ago. With some added muscle and time, Bolek believes, young Ramirez could have “a great physical presence” on a baseball field. “At some point, people are going to look out at a baseball field and see Manny Jr. and not his father,” he predicts. Don’t count on him being drafted by Boston. 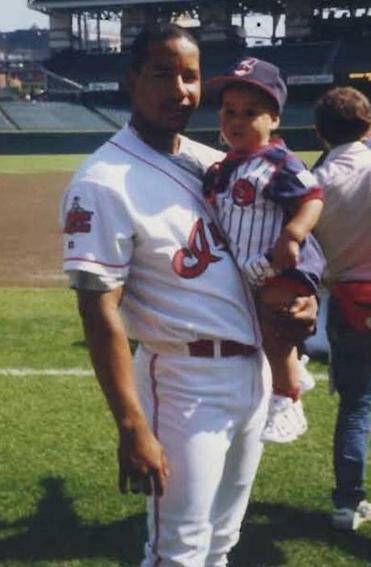 Manny Ramirez holds his son on the field early in Ramirez’s Indians days. In some respects, Manny Jr. has flown under the radar, a late bloomer. 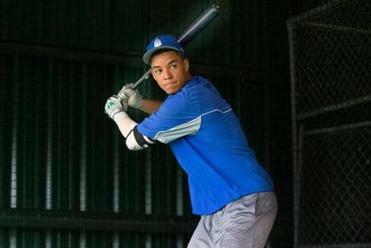 At IMG, he hit .365 with two home runs and 27 RBIs in 74 at-bats of strictly tournament play. He was MVP of the Cleats Sports Classic Invitational in Mesa, Ariz., in March, going 3 for 3 in the final game, hitting a grand slam, and knocking in six runs. There was no styling on the 420-foot home run, no arms up in the air. “Just watched it while I was running,” he says. Nor will he get dreadlocks. “Too hot in Florida,” he says. Nor has he been heckled with steroid chants yet. But he knows that is coming. He says the pluses of having the famous name outweigh the negatives. He remembers hugs from Big Papi (“he’s the Man”), hitting advice from Don Mattingly (“my Dad helped me more”), and the two months he spent with his father in Mannywood (i.e. Los Angeles) during summer vacation. “I got to experience a lot of things that other kids don’t,” he says. Manny Ramirez Jr. tries to catch a ball while wearing goggles that mimic game-time distractions in an IMG Academy drill. The lanky teenager says he never asked his father about the choices he made. According to Manny Jr., his father felt abandoned after his suspensions from baseball, and that he also regretted two incidents in particular — a domestic dispute with his wife in 2011 that resulted in a battery charge that was later dropped, and the time in 2008 when he knocked Red Sox traveling secretary Jack McCormick to the floor in a dispute over tickets. Ramirez says his father was never focused on the Hall of Fame. With his life in turmoil, Ramirez turned to God. Manny Sr. wants his son to go to college first and get a degree, then play professional ball. “He’s really old-fashioned,” says his son. Ramirez says he hopes he is drafted by the Texas Rangers because he likes their minor league system. He also committed to attend Central Arizona Community College, a baseball powerhouse, in the fall. A decision will be pending. Ramirez Jr. keeps in close touch with his father. But Manny Ramirez will not return to Taiwan or attempt another major league comeback next year. “He’s done in September,” says his son. Meantime, although the scouting report says the young Ramirez is extremely calm, mature, hard-working, and humble, he does have a little of his father’s bravado. He also has the wisdom of a shattered dream. And he says performance-enhancing drugs are not for him.